Many people will chose an area to move to based on what schools are available for their children and what those schools have to offer. It is important to make sure that the area you are moving to is going to enrich your children and expand their horizons. The Russian River has natural beauty, strong close knit communities, and great schools! 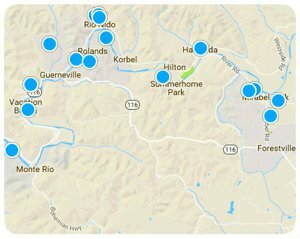 Here is a collection of all of the schools near the Russian River, Ca. Guerneville Elementary School is a local school that offers children the chance to shine with a full, challenging curriculum, the ability to explore nature, athletics, and performing arts. The school hosts annual events that welcome the community, parents, staff, and children to learn and celebrate together. Due to the rural area there is no junior high or middle school available for children so Guerneville school encompasses grades k-8 to make sure your children are getting the education the need and deserve! The school offers some great enrichment programs such as the after school program for children whose parents work late, the Guerneville school garden so that children can learn about agriculture and grow accustomed to making healthy choices, as well as sports programs that teach discipline, responsibility and team work! Forestville is located just fifteen minutes east of Guerneville along the Russian River, and is home to one of the best schools in the area. Actually, some would say that it is two schools meshed into one building, however the children don't seem to see the difference at all. When children begin school they start in kindergarten and then continue to first grade. Forestville Elementary school is a public school that has only kindergarten and first grade. Once your children have graduated to second grade, it is time for them to join the Forestville Academy for grades 2-8. The two schools are in one building, all mixed up, so it never feels like they are being separated from each other, allowing them to create friendships that can last a lifetime. In both the elementary school and the Academy, children are held to a high standard and no child is left behind. The teachers and staff are notorious for working with the children and their parents to make sure that they are reaching their full potential. Monte Rio Elementary School is the home of the Tigers! Monte Rio is a riverside resort town located just ten minutes west of Guerneville, Ca. The school hosts grades K-8, and is known for it's attention to the small details that can have a huge impact on your child. The teachers and staff are available to help your child whenever they have a question, and they provide available sources that you and your child can utilize to help them with their homework. They also have a monthly newsletter that will keep children and their families updated on what is going on so you can stay involved and experience their childhood to the fullest. The school has an emphasis on children's health, and is constantly exploring new ways to help teach your children to make healthier decisions and live an active life. El Molino is the home of the Lions! They recently celebrated their 50th anniversary as the local high school here on the Russian River. El Molino is a school of Scholars, it's a school where respect, compassion, and resourcefulness are highly valued and the students are articulate and ethical. El Molino hosts grades 9-12 and is notorious for it's outstanding athletic programs and rigorous curriculum. They also offer dance, drama, and music for the more artistic crowds and Agriculture for those who have an inclination to be one with nature. El Molino has a great teaching staff that communicates with parents to make sure they are informed on their child's strengths and weaknesses, allowing parents to be involved in their child's education and giving them the best chance to succeed. Montgomery Elementary is more commonly known in the area as Cazadero school. This school was built on a hill surrounded by breathtaking redwoods and has a huge slide that the children go down to get to the playground. This is a small school with between 20-30 children in the whole school and three teachers. The classes are k-2, 3-5, and 6-8 and each child has their own computer to work on at school. Montgomery Elementary School is the home of the catskinners and the most unique aspect is the one on one attention that each child receives due to the small class sizes and dedicated teachers. Although this school is small, do not be fooled, it has all of the accommodations of a larger school, if not more. They have after school care, bus service, 2 full time teacher aides, and a special ed teacher as well. Every year the children from Montgomery Elementary School put on a Christmas performance at the Firehouse in Cazadero and the whole community comes out in support of them.